Knowing the correct rules for capitalization can be challenging, especially for words such as federal and state. As a result of this, the question of whether “federal” is capitalized often arises in different conversations both at schools and other places. In some cases, the general rule above may not always be followed. For instance, when the word is used as part of a title of any published document, it has to be capitalized. This also applies in cases where one is using a quote from another published piece. Direct in-text citations require capitalization if the first letter is capitalized in the original text regardless of whether it is used as an adjective or noun. Yes, because “Federal Government” is a proper noun. When referring to the Federal Government in its official capacity, you should always capitalize both the words Federal and Government. The fact that most professional editors like to use the word in lowercase letters can add to the confusion about its correct capitalization. However, government guidelines and other writing styles can provide the best guidance. 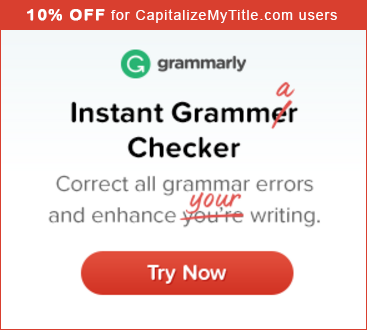 Previous articleDoes Grammarly have a discount?